First look at writer-director Mike White's upcoming comic drama. Not having directed a feature since 2007's Year of the Dog, The Good Girl and School of Rock writer Mike White is having something of a comeback in 2017, penning Miguel Arteta's class conflict drama Beatriz at Dinner and directing his sophomore feature Brad's Status. The flatter stars Ben Stiller as a man who experiences a mid-life crisis when he revisits the Boston college he attended as a student. Michael Sheen, Luke Wilson, Jemaine Clement, Jenna Fischer and Austin Abrams also star. Brad's Status is in US cinemas September 15th, but a UK/ROI release has yet to be confirmed. 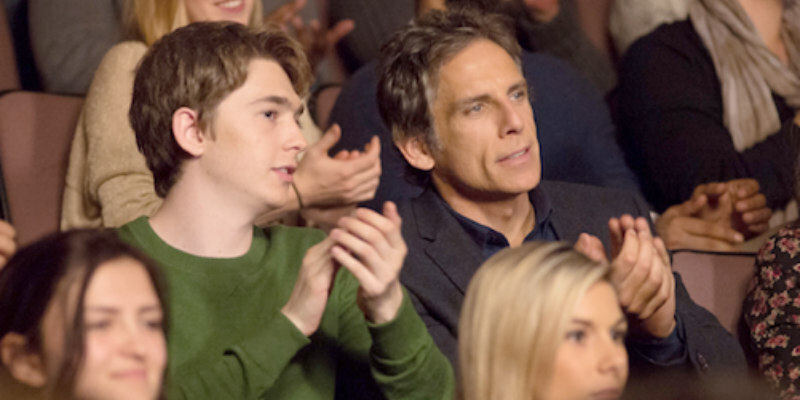 When Brad Sloan (Ben Stiller) accompanies his college bound son to the East Coast, the visit triggers a crisis of confidence in Brad's Status, writer and director Mike White's bittersweet comedy. Brad has a satisfying career and a comfortable life in suburban Sacramento where he lives with his sweet-natured wife, Melanie (Jenna Fischer), and their musical prodigy son, Troy (Austin Abrams), but it's not quite what he imagined during his college glory days. Showing Troy around Boston, where Brad went to university, he can't help comparing his life with those of his four best college friends: a Hollywood bigshot (White), a hedge fund founder (Luke Wilson), a tech entrepreneur (Jemaine Clement), and a political pundit and bestselling author (Michael Sheen). As he imagines their wealthy, glamorous lives, he wonders if this is all he will ever amount to. But when circumstances force him to reconnect with his former friends, Brad begins to question whether he has really failed or is, in some ways at least, the most successful of them all.